Intrude presented by Ron Farris Real Estate will be at South Perth Foreshore - Sir James Mitchell Park from Sunday March 15th to Saturday March 21st 2015, nightly from 6.30pm to 10.30pm. Artist Amanda Parer from Tasmania and fresh from Vivid Festival in Sydney brings her unique outdoor installation 'Intrude' to South Perth. At 7m tall and illuminated in white, the oversized giant rabbits will transform our City's foreshore as they nestle into their new home. Highlighting the problem that is too easy to ignore, our impact on the environment. They will lure us in with their presence evoking memories of our childhood. 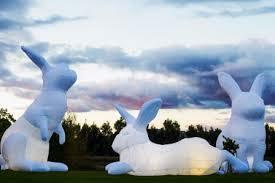 Amanda Parer is an artist who creates ethereal works in a variety of forms with installations, sculptures and paintings. The aim of her works is to explore the fragility of the natural world. She has a wealth of art prizes to her name and has exhibited all over the world and is represented by commercial galleries in Hobart, Melbourne and Sydney. The City of South Perth is honoured to have Amanda's amazing work as part of South Perth Fiesta. Keep up to date or follow the #southperthfiesta conversation on the Council's Facebook, Twitter or Instagram page and join the Facebook event page for regular event updates.